Stories of social work well worth reading. Some worth retelling! 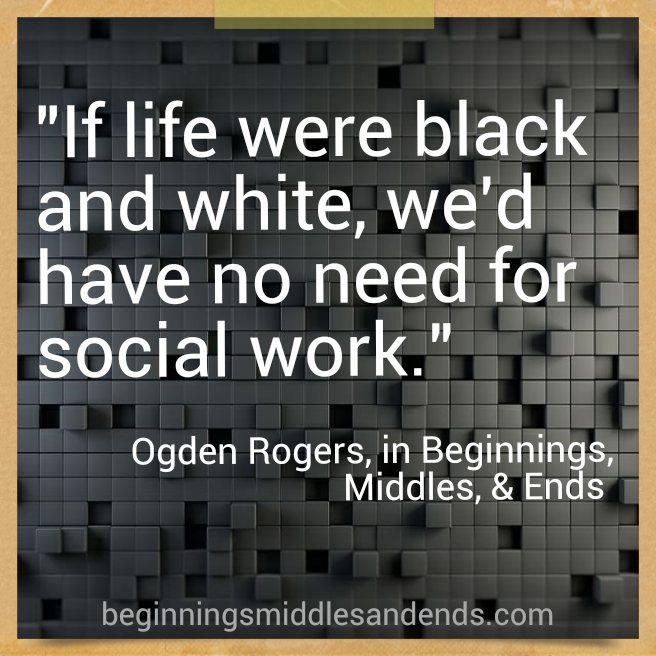 The following is an excerpt from the "Middles" section of Beginnings, Middles, & Ends: Sideways Stories on the Art & Soul of Social Work," by Ogden W. Rogers. Social work is always about being in the middle. We are always guests in another’s house. The social worker in the hospital is the one who knows most about outside of the hospital. The health care worker on the street is the person who knows most about getting into the hospital. The genius of the social worker is that she or he is always between things. The master of the art appreciates the muddle that is life and demands a profession that dances down a razor’s edge. The worker who has “it” is the worker who knows that between me and thee is a fuzzy ball, a place where you invite “the other” to come in. To place hands upon the keys and make music. A place to cast off the cast iron of failed expectation and work in the muddle of the moment. What will emerge is anyone’s guess, but at least it is not the pain of what once was. 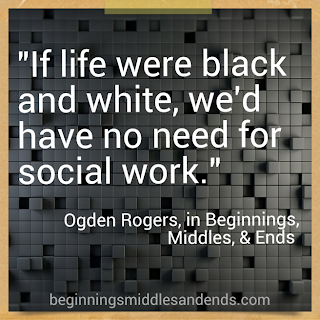 If life were black and white, we’d have no need for social work. Police and lawyers and judges and accountants could solve most of what could be called conflict. But life is really quite a gray thing, and despite the anger that wells in those who rail against gray, who want things black and white, they know they need us. Copyright 2015 White Hat Communications. Picture Window theme. Powered by Blogger.